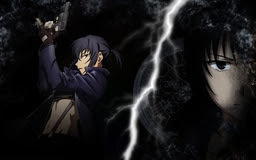 My new wallpapers is to the series CANAAN. This wallpapers are inspired by the song Rainbow in the Dark from the band Dio led by metal legend Ronnie James Dio. I have redo this wallpaper four times to end up with this version. I had the idea maybe a year ago, but I could not end up to give it the right shape. But Monday (11.II.2013), I have take a little pause in work, closed eyes and listen to this great song... And finally I have see it. - Alphard and Canaan are "the rainbows" left in the dark. All the characters of CANAAN were like lost in the darkness, so thats is why I think it suits to lyrics: "You've been left on your own, Like a rainbow in the dark". - ... what to tell to this, hmmm, don't know, the wallpaper just needed to be dark. 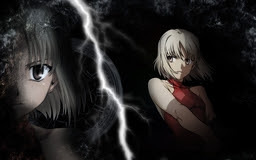 - it is pretty dominant in the wallpaper, it shows the freedom which both want to, some light in the dark (Canaan have found it). - this is interpreted with the clocks and the image of Alphard/Canaan "swallowed by the darkness". This should also remind on one of the last scenes from the anime, in the gallery where Maria stands before the pictures she took. PS: I really thanking to the author of the vectors of Canaan & Alphard. If you know (or you are) the author of them, please contact me so I can provide proper crediting.